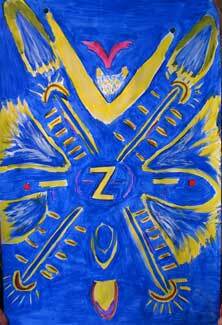 THE LIGHTNING PATH - An Invitation to Co-create - 2 MULUC. February 27, 2006. In communication with the Divine. DWAYNE: I came into this session with a desire for us to spend longer in our preparatory stage. This essentially meant spending more time in meditation, consciously opening to guidance from spiritual realms. Terry was agreeable to this and as soon as that guidance was forthcoming we began a very intense exchange wherein a lot of shadow material came up for us to examine. I consider this to be a very valuable part of the practice, one that inevitably leads to much insight and personal growth. 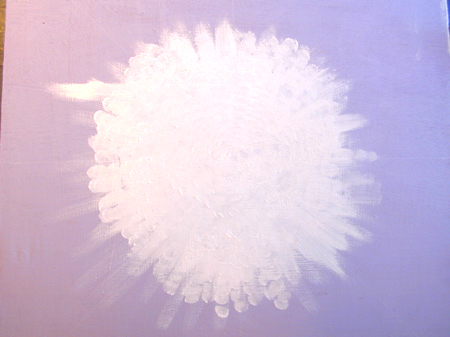 As we pushed on into actually painting I was impelled from within to paint the "white effulgence" I had experienced in my meditation. In sharing my experience with Terry I had her recall a pristine moment we had shared at the waterfall shown above. She immediately got what I was talking about and soon produced the picture you see here. Agreement is paramount to our co-creation process; nothing can be achieved without it. So I suggested that, in order to avoid misunderstanding when attempting to describe what we had received in meditation, we use pencil and paper, draw what we had imagined, and then see how aligned they were. Dwayne had caught his vision very strongly in radial symmetry. When I described mine, we were both struck by the differences. Because we had vowed not to start painting until we both received the same vision telepathically, we moved back into our tantric meditation to try again. And again, the same things came through. When we focused on the differences of our visions the old issues raised their hoary heads: we both feared the other was not respecting our own authenticity, and that there was judgment that how we were behaving was not right in some way. These fears come up every time we have ideas that only work for us, and the other is firm about it not working for them. We become trapped in our own point of view, and our egos rise to the occasion, making their case very righteously. I must say that Dwayne is much better at being a witness to his own ego struggles than I am. I come from a place where I have been judged very harshly over time, in a long term relationship, so emotions get triggered and muddy up the waters for me. I jump to the conclusion that he doesn't love me, respect me, etc...... This manifests as tears of remorse and self-deprecation. Attachment to view, like a rope around the foot, prevents us from surging forward into a new and ever-changing awareness. Attachment to view makes acceptance and appreciation of the diversity within each and every lifeform possible. When we cut through the rope, we embrace the difference, celebrate the unique light within each other, and take part in the Cosmic Dance, which is Love. What cleared the waters? A call back to the original purpose: love made manifest through communication with the divine. Wow. The simplicity of it hit us. Two Muluc. Two. A combination of our images completes the Vision. Which, incidently, had been the same, in essence, all along. Acrylic on plywood 24 in. x 24 in. Water is the element of the second chakra, the position of this Moon cycle on the steps of the pyramid temple. All elements are manifest from pure Light, or consciousness. This light is reflected in the water flowing towards us from a distant nebulous source. It becomes turbulent as it progresses towards a narrow fissure in the stone, as most things do under pressure. It is propelled over a precipice and becomes fragmented by the forces acting upon it. Water is merged with air, as it is transformed into billowing clouds of vapor and foam. Water reminds us of the emotions, the subconscious, the raw energy held latent within us. Visible, yet invisible. Energy is released when elements combine, allowing transformation to occur. When we cease to see ourselves as separate and unite in consciousness with the Beloved we become struck by lightning, or enlightened. The hands represent human aspiration. They reach into the light in hopes to communicate with Spirit. 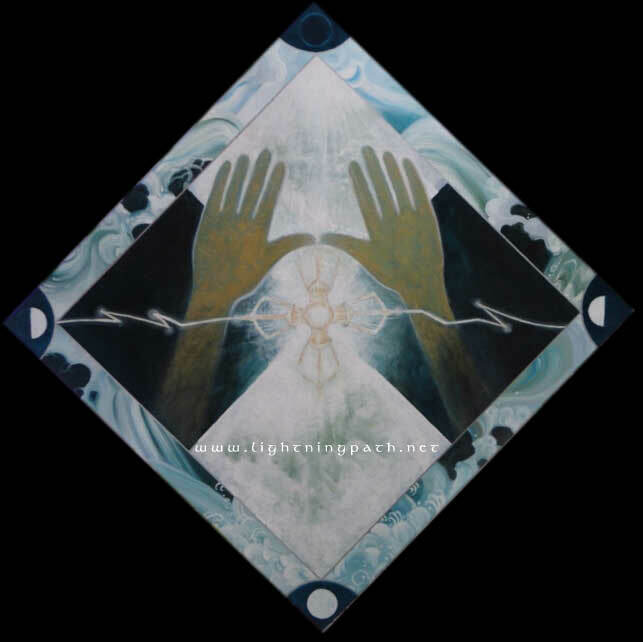 They form a bridge, symbolizing the ability of love in action (art) to dispel separation, and bring about psychic wholeness. They reach from the darkness, the rigidity of stone, attachment to view, towards the light, which is the beacon of consciousness. 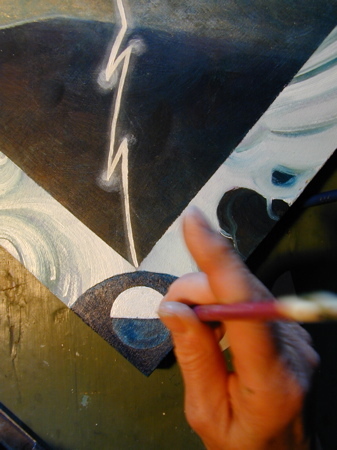 At the centre of the painting is the double vajra, a symbol of unity. Emitting from it are two bolts of lightning: when two paths join in harmonious union, the energy released makes anything possible. 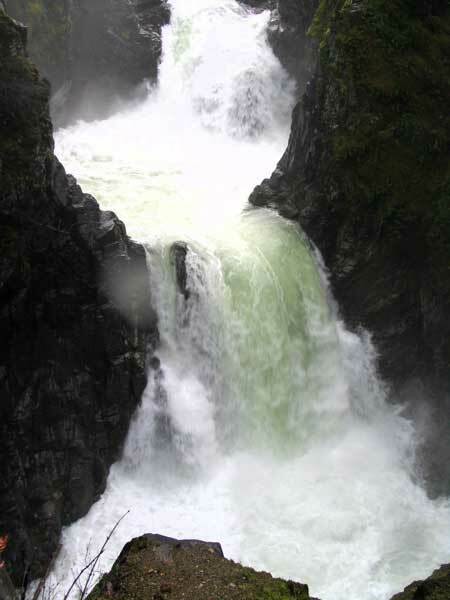 In awakening the potential which lies within us, and giving it the energy it needs to actualize, it rises like clouds of vapor at the base of a waterfall, refreshing, invigorating, and empowering us to realize the Godseed within. This Chinese New Year is my year (Dog). 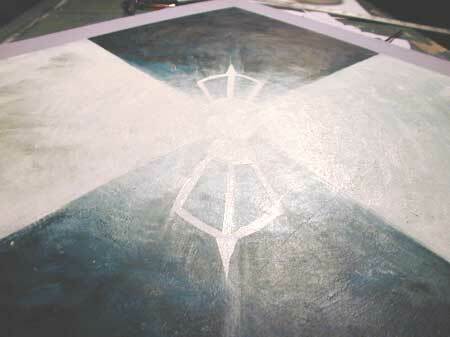 I had some hesitation in getting started but once I actually began painting things began to emerge. What is it that has emerged? Time will tell. 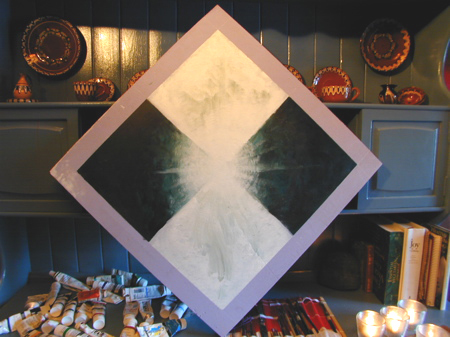 Updated April 16, 2006: The path opened for me with the galactic center right in the middle of my painting and it has brought forth a change in a few very close relationships. It has since been a time of letting go, pushing forward in myself, my journey, my center, my ability to let love free from my heart and trust in the divine. 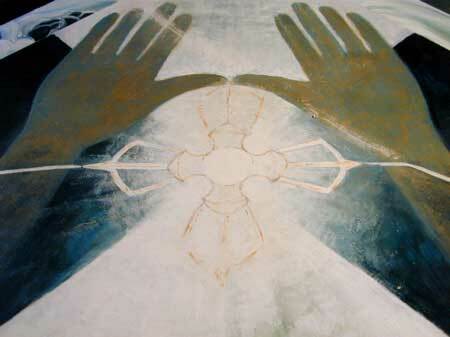 DWAYNE: Eileen unconsciously placed the commonly used symbol for Galactic Center at the center of her painting. I take this as a very positive sign that she is completely aligned with the higher "galactic" dimension of this co-creative effort we call The Lightning Path.